B and I have an inside joke where certain dinners are “Jen Special…” dishes. This is mostly because prior to moving in with B (and even to a certain extent now) there are a few standards I go to. One of the “Jen Special…” dishes involves some sort of protein, vegetable, and starch with herbs, lemon, and/or garlic. The past few nights we’ve had curry and Korean take-out so I wanted something boring and, well, one of the “Jen Special…” dishes. 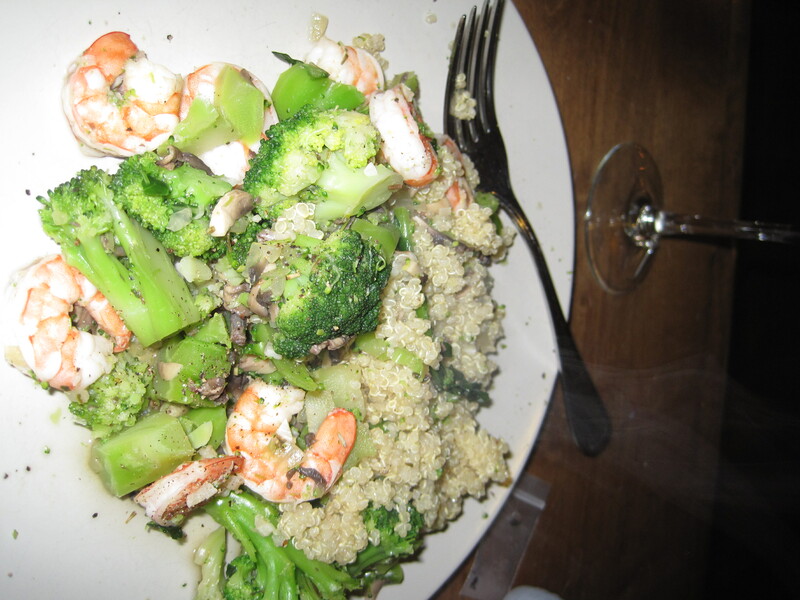 Tonight I made shrimp with broccoli, mushrooms and quinoa. Most of the PointsPlus come from the quinoa (1 cup = 5 PP and 1/2 cup = 3 PP). This was also very quick to make; I think it only took about 20 minutes to prepare and cook (which is why its the perfect weekday dish). Enjoy! In a large saute pan, add “I can’t believe it’s not butter” spray and olive oil. Add garlic and onions making sure not to let the garlic burn. Add mushrooms and saute for 1-2 minutes until the mushrooms are lightly browned. Add broccoli, vegetable broth, water (as necessary), salt, rosemary, and basil. Allow to saute/steam for about 4-5 minutes or until liquid has reduced. Add shrimp and cook for about 1 minute on each side or until the shrimp have reached the pink color necessary for them to be completely cooked. Serve over quinoa.